Today, I picked up three small acorn squashes and, though my daughter isn't fond of squash, thought I'd cook them especially for my Dad, who likes soft food and has requested squash. It's so easy with my Instant Pot pressure cooker to prepare squash using a technique by my friend Lani Muelrath that I described last February. She puts a trivet (to keep the food from touching the pot) into the Instant Pot, rinses an intact acorn or butternut squash, puts in a cup and a half of water (I think that I put even less in; it shouldn't be so much as to get over the level of the trivet), and pressure steams for 8 minutes. The squash can then be sliced very easily, seeded, and served. I was thinking of going with 7 minutes since my squashes were small, but I stuck with 8 minutes to ensure a soft end product for my Dad. I also found a nice sale on frozen chopped chard. Why not stuff the squash with the chard? Here is what I did. I prepared acorn squash in the Instant Pot as described above. In the meantime, I put the 1/4 cup of water and bouillon cube in a small stock pan, brought to a boil, then added the chard, peanut butter (I normally cook with no added fat, but thought that a little bit of the peanut butter would add an interesting dimension of flavor - and, as noted above, this amounted to just 3g or so of fat per serving), onion, nutritional yeast, and salt, and simmered for 7-9 minutes uncovered (the package suggested simmering covered, but I wanted to thicken the greens a bit), stirring occasionally. I also cooked some no-fat "refried" beans, mixing in a little bell pepper and, for the adults, jalapeno pepper. I was surprised! I liked dinner but wasn't enthusiastic about any of the flavors. The greens benefited, I think, from the peanut butter and tangerine. It was all good but I didn't love the meal. However, everybody else seemed to enjoy it more than I did! 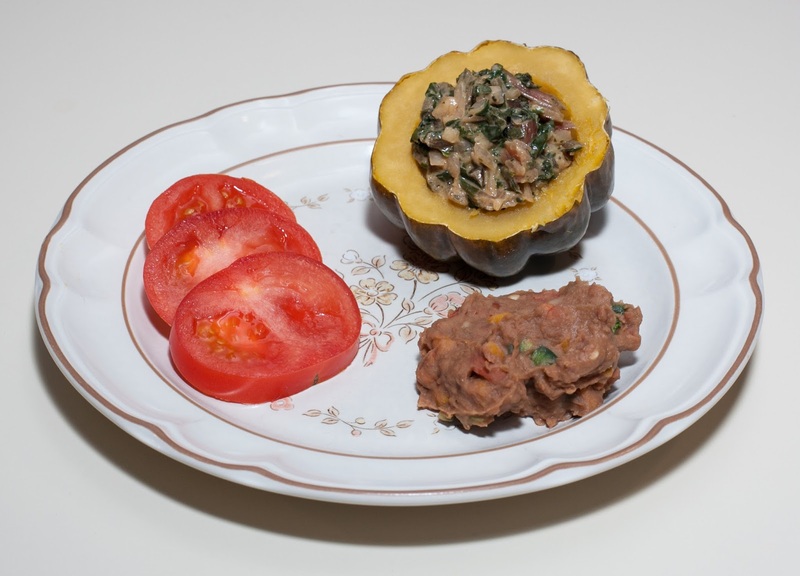 I was particularly surprised by my daughter who has said that she doesn't like squash - for the first time in a while, she quickly ate everything on her plate, and praised the meal numerous times. Yay! I'll bet this would be even better with additional touches of flavor, such as capers or olives or possibly dill pickle pieces, and/or raw kale pieces. I wonder what a thick dhal would be like served inside a halved squash. I definitely need to explore some citrus cooking! My wife ate out tonight so I made a tofu dish since she doesn't eat tofu, but my daughter and I enjoy it. My Dad wanted a simple mixed vegetable dish, so it worked for him, too, and I served him a single piece of tofu for good measure. I just cooked kale, peas, carrots, and tofu at low pressure in my Instant Pot for 3 minutes. I also made some Candle Cafe portobello and kalamata olive ravioli, topped with fire roasted tomatoes. Dinner was good! My Dad is visiting and asked for a thin yellow split pea dhal. I had yellow split peas on hand; they are so easy to pressure cook using a ratio of part split peas to three parts water for 6-10 minutes. I picked up some red chard today, and wanted to cook with it and potato. Though my daughter doesn't like ginger, it is so healthful that I still used it with the meal. Here is what I did. I rinsed the split peas several times then combined them with the water, bouillon cube, potato, turmeric, cumin, and ginger. I wanted to cook some of the chard down so it was soft or even dissolved into the dish so that my Dad could easily get some greens. I cut the bottoms off of the chard up to the greens, and diced to 1/4" cubes (about 1/2 cup), and added the cubes. I cross-cut the rest of the chard, stem and leaves together, into 1" squares and reserved them. My wife had just sliced some apple and I had the idea of throwing in the apple core to see if it would lend a bit of a slight sweetness, so I did. I set my Instant Pot pressure cooker to 8 minutes and closed it. After the cooking was done, I waited a few minutes and gently released pressure. I added the salt, onion, and lemon juice, and served my Dad. I quite liked the taste, and he seemed to enjoy it. To the rest of the dish I added the chard squares, mixed, and let sit for about 5 minutes so the chard could cook just a bit in the remaining heat. I also made a simple quinoa dish by briefly sauteeing, with no oil, sliced shallot, then adding quinoa and twice as much water, as well as a vegan bouillon cube, a little turmeric, a little salt, and a little ground cumin. I brought to a boil and simmered for 3 or 4 minutes, covered, then turned the heat off, mixed in some frozen peas, and re-covered the pan for another 10m or so. We all loved the dhal. 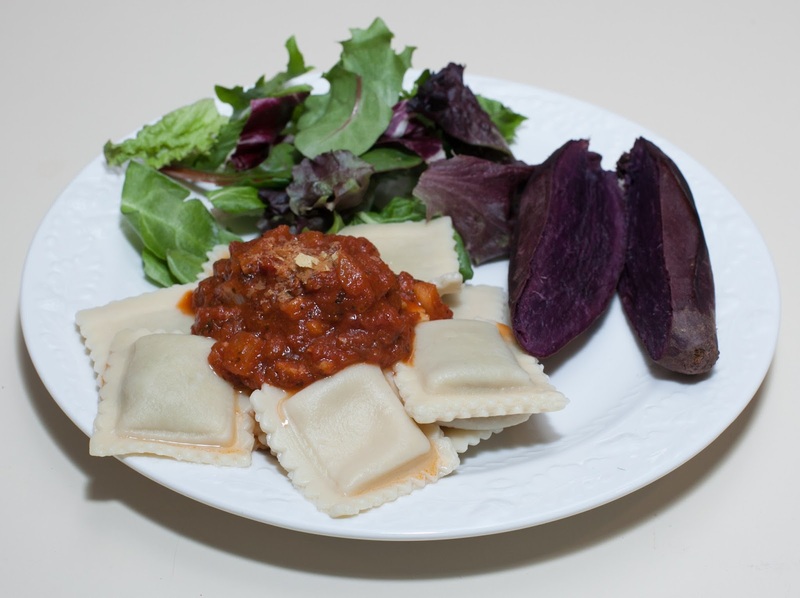 It had a nice, hearty flavor, and the greens added an extra health boost and nice flavor and texture dimension. I loved the potato cubes - done perfectly for this dish, yielding nicely to tongue pressure in the mouth but otherwise maintaining shape. Surprisingly, my daughter normally doesn't like quinoa, but quite liked it today. She also didn't complain at all about the ginger - yay! A few cloves of garlic would have been nice cooked with the dhal, as well as perhaps a bit of jalapeno. Let me remember - 3/4" cubes of potato cooked in water for 8 minutes is yummy! I rinsed the beans and rice again, added the 6 cups of water and bouillon cube, then cooked in my Instant Pot pressure cooker for 30m. I also heated some frozen roasted corn kernels and served with lemon juice and salt. I was thinking of using black beluga lentils for a main course today. They cook in a 1:4 ratio of lentils to water over 15-20 (12 for salads) minutes. My Dad is visiting us for a few weeks, and I thought he'd enjoy the dish. In a large Saladmaster stock pan, I put in the shallot and sauteed with no added oil for a few minutes on medium heat, stirring occasionally. 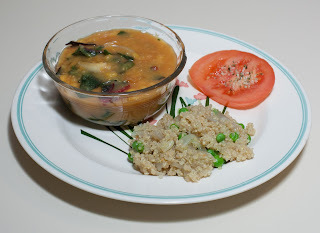 When the shallot was softened, I added the mustard seed, stirred for about 15 seconds, then added the rest of the ingredients except for the lemon juice; I skipped the ginger and jalapeno entirely, for my daughter's sake. I brought to a boil then covered (with the broccolini in a bowl, as below, for a side dish) and simmered on low heat for about 17 minutes. I added lemon juice, stirred, and served. I would have liked ginger and spicy heat; I just added some hot chili powder to the bowl for all the adults. In addition to simmering the main course, I decided to steam a bunch of broccolini in the same pan. I couldn't find my steamer basket, so just put the broccolini in a bowl atop the other ingredients. When I served the main course, I also served the steamed broccolini. I topped the broccolini with a small amount of Heidi Ho brand Chia "Cheeze" that I had put in a bowl and left in the finished pot for a few minutes to nicely melt. I used maybe a teaspoon per plate - at 4g of fat per ounce this was probably 2g of fat, so I'll classify this meal as almost no added fat. For some time, I've been enjoying rices like Madagascar Pink and Bhutanese Red, and will continue to do so. But I've recently had a desire for plain old brown rice. I made a batch (1 part rice to 2 parts water, along with a bouillon cube and a little salt; 50m simmer should do it or perhaps 20-30m under pressure, but I usually make brown rice in my Zojirushi rice cooker, as I did today. Boy, does the rice come out great! Dinner was great! We all enjoyed the dhal. I had originally thought that I would make a less liquidy lentil main course, but it was just fine being a dhal. The rice was so good! I think that both my wife and I had seconds and thirds of both dishes. I like kale, and it's so healthful! This batch was particularly tasty and I couldn't stop eating pieces of raw kale as I was cooking. My daughter also enjoyed nibbling on kale. We are in the midst of a few-day ice storm; my wife shopped yesterday and noticed a lot of good and tender produce. She surmised, correctly I think, that local farmers probably harvested a bit early in advance of the storm. This vegan cheese is very good. Used in small quantities, it contributes just a little fat but a lot of nice flavor. I have made vegan cheese sauce before and should do it again. I should also get this Heidi Ho brand of "cheeze" again. I'd like to experiment with cooking these lentils with less liquid and getting a plated side dish. It would also be nice to try a black beluga lentil salad.
. Here is what I did. I fire roasted the green bell pepper till it was uniformly charred, then put in a brown paper bag and closed down the bag. I put all of the remaining ingredients except the bell pepper into my Instant Pot pressure cooker and cooked for 3m. After the cooking was done, I removed the now cooled pepper from the bag, rinsed and massaged it under water to remove the excess charring, cut it in half, removing the stem and seeds, then cut it into strips approx. 1/4" x 1". I waited a few minutes and gently released pressure from the Instant Pot, then opened it, mixed in the bell pepper, and served.. I also made long-grained brown rice (starting with 2/3 or so of a cup of rice, I cooked with the typical 1 part rice : 2 1/2 parts brown rice, along with a vegan bouillon cube, in my Zojirushi rice cooker for its cycle of about 45-50m). I love children and babies, and felt so fortunate to have a fellow vegan family with a baby just 1 month old over for dinner. How lucky for us! The husband especially likes Indian food and enjoys a lot of spice, but the wife likes minimal spice. I wanted to use fenugreek, which is supposed to help breast feeding mothers to produce more milk (though it may only be effective in higher dosages and possibly problematic at even higher ones). I thought that I'd make a split pea dish; it's so easy in my Instant Pot, cooking in a ratio of 1:3 over 8-10 minutes of high pressure. 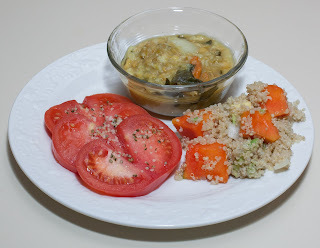 I loved my recent collard green experiments, and thought I'd cook collards with the split peas. I also used a head of cauliflower. My wife had picked up a papaya a few days ago, and I wondered what a savory quinoa-papaya-avocado side dish might be like, subtly flavored with onion. Here is what I did. I put all the ingredients except the onion, lemon juice, and salt, into my Instant Pot pressure cooker and cooked for 9 minutes. I served with cut jalapeno on the side for any who wanted to add some spicy heat. I also made the quinoa, simply by sauteeing 1/2 cup of roughly (maybe 1/2" or even a little larger cubes) chopped onion, and 2 t of chopped (1/8") ginger with no oil in a large Saladmaster stock pot over low-medium heat for 2 or 3 minutes, stirring occasionally, then adding 1 1/2 cups quinoa and 3 cups water, along with a pinch or two of salt. I covered the pot and brought to a boil for 3 or 4 minutes, then turned the heat off and let the quinoa sit for at least 10 minutes while the dhal was cooking. I mixed in half of a large papaya with seeds (surprisingly, only had hints of a few seeds - I've never otherwise seen a seedless one) and skin removed and then cut into 5/8" cubes (about 2 cups), as well as similarly cut avocado (my large avocado resulted in a bit over a cup of cubes). Wow, dinner came out better than I had expected. All seemed to enjoy. It was nice seeing how the cauliflower cooked down essentially into a thickening agent. The fenugreek added just a bit of bitterness, but it was fine. The star of the meal was the quinoa. What a great combination papaya, avocado, and quinoa makes. Why didn't I think of something like this before? Split pea dhals always come out well. I should make more dishes with cauliflower both cooked just for a few minutes to keep its contributory texture, and also cooked down like I did today. Maybe we need to buy papaya more often - it sure was great in the quinoa. Both the avocado and papaya were just barely ripe, and I think it probably worked well, as they were suitably firm. My daughter suggested soup for tonight, and I was happy to make it on this cold day. I put all the ingredients but the salt and lemon/lime juice into my Instant Pot pressure cooker and pressed the "Soup" button, which resulted in a 30m cook time. After the cooking was done, I waited a few minutes and gently released pressure, then added the salt and lime/lemon juice. I served the soup with a bagel half. I didn't realize that we were out of tomatoes, as I was going to serve the bagel with a slice of tomato. 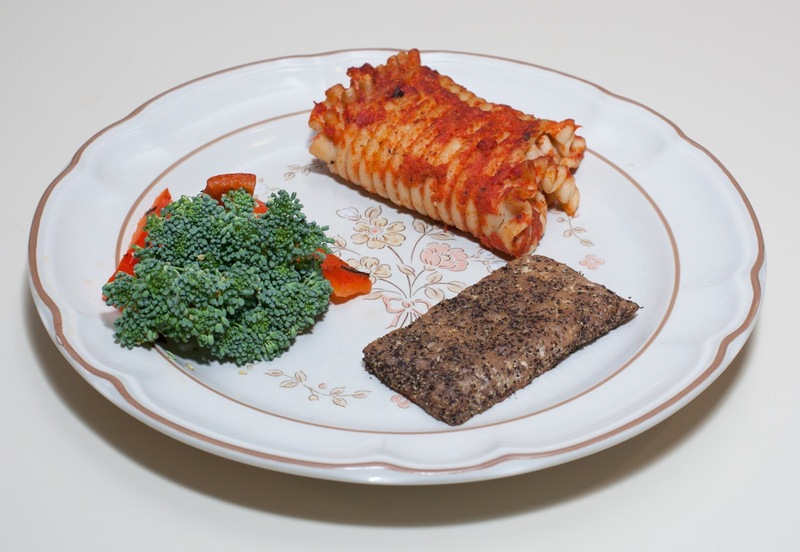 Instead, I put on just a light smear of Heidi Ho Chia "Cheez"; it is 4g of fat per ounce, and I put on well under an ounce, so maybe 2g of fat (hence the "almost no added fat" for dinner). We were also low on other salad ingredients, so I chopped some Napa cabbage for a simple side salad. Wow, this soup was excellent! I shouldn't take credit but rather pass it on to the Instant Pot. It's amazing what it does for soups. The flavor was rich and tasty. Yum!! I made about 9 cups of soup and my wife, daughter, and I ate 2 or 3 servings (or 4?!) each, eating up a total of 5 cups! The soup could have used a stronger garlic flavor; I ended up adding some garlic powder and also a little more salt at the table. The potatoes were great. 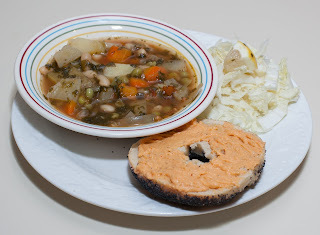 A little (just a little - maybe 2 cups total) more greens might have been good; I was glad that the spinach was chopped, as a coarsely cut green would have changed the mouth feel of the soup disadvantageously. Maybe a little more beans (starting with 2 cups maybe) would be good. I could hardly tell there was wheat berries, so those could have been at least doubled. Adding a few tablespoons of wine and maybe nutritional yeast could have been nice. But, really, this was excellent as is. I should make soups in my Instant Pot more often! My daughter loves (vegan, of course) macaroni and "cheese" and a few days ago I picked up the relatively new cashew-based Heidi Ho brand Creamy Chia Cheeze. I boiled some whole wheat pasta shells, drained, and mixed in seitan chunks and onion, as well as a little of the "cheeze" and soy milk and warmed. I also made a waterless collard green dish in my Saladmaster small stock pan. Dinner was great! Everybody, including my wife who doesn't usually like cheese of any kind, enjoyed the meal. We had some of the smoked salt and pepper "hempeh" left (now we'll have to buy some more!) and I thought I'd make a pasta dinner with the tempeh on the side. 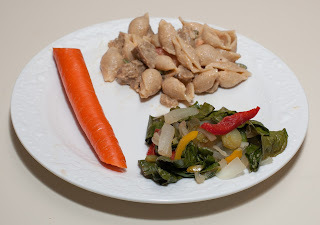 I sauteed the tempeh, along with half-moon slices of onion in a cast iron pan with no oil; when it was lightly brown, I added frozen spinach and bell pepper, as well as some chopped carrot that my wife had left, and cooked for maybe 5-7 minutes till hot. 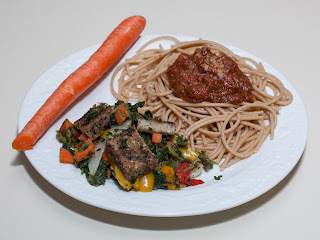 I served the tempeh and vegetables, along with whole wheat pasta with marinara sauce. Dinner was good! I am excited to report that I finally made my first experiment today with making vegan yogurt, and I think that the results were promising. I first picked up my first Instant Pot back in March 2014, excited about the idea of making my own yogurt. It turned out that the Instant Pot was so incredibly useful for easily making meals, that I have focused on that. My key resource was Instant Pot enthusiast Donna Haney, who has a nice description of the process online. I followed her basic idea of putting a plant milk with minimal ingredients (I used Westsoy brand unsweetened plain soy milk) into the Instant Pot along with a vegan culture and just using the Instant Pot's "Yogurt" button, which brings the milk to 96.8-109.4°F. The longer it is cultured, the more tart and sour it becomes; Donna recommends 9-10 hours. I used three separate glass containers. I didn't sterilize them, though, to be careful and not end up culturing any "bad bacteria", I could boil them first. Donna doesn't take this step and just makes sure that she starts with clean containers, as I did. I put about 6 ounces of the unsweetened plain soy milk into each of the containers. I added existing store-bought unsweetened yogurt. In the first container, I used a teaspoon of So Delicious brand Greek style plain unsweetened coconut yogurt. In the second and third, I used Kite Hill brand plain unsweetened almond yogurt; 1 teaspoon in one and 2 teaspoons in the second. I put the containers into the stainless steel pot that goes in the Instant Pot with nothing else - no water in the pot or anything. I pressed the "Yogurt" button and adjusted the time to go for 9 hours. When the time was up, the top readily opened; there wasn't much pressure. The yogurt was good but not very sour. I returned the bottles to the Instant Pot and pressed the "Yogurt" button again and adjusted the time to 5 hours to get a total of 14 hours of culture time. That's it! The yogurt was runny (would make a great Indian lassi) but good. It had a good amount of tang. My wife loved the yogurt, especially the one with the double dose of the almond yogurt. My daughter and I preferred the first bottle with Greek yogurt as the starter. The yogurt was excellent when we then mixed something in for sweetness; I used organic strawberry preserves, my daughter preferred maple syrup, and my wife used raisins. Though it was a bit runny, it was warm. We finished the Greek yogurt started one, but went ahead and cooled and refrigerated the other two bottles. We look forward to seeing what they're like tomorrow. Without sweetener, this is of course good with Indian flat breads, served with rices, used to make a cucumber-yogurt raitha, for a salty Indian lassi, or any number of other savory uses. Sweetened, it's great to now be able to have organic berry yogurt (I have not been able to find yogurt made with organic berries in the store, and we are careful about trying to eat only organic berries). It's wonderful how easy this is and how it avoids buying yogurt in containers that we then have to recycle. I'd like to try this again, using more starter culture, perhaps a tablespoonful of yogurt. I could certainly save some of the homemade yogurt as starter but for now want to first keep on experimenting with a base yogurt. I would again go with 14 hours or maybe 15 or 16 hours for more tang. I'm not sure why the Instant Pot's yogurt program has such a range of temperatures. The Cultures for Health site suggests keeping the nascent yogurt between 105-112°F and culturing it for 6-8 hours, then letting it set in the refrigerator for up to 24 hours for maximal thickness. The fatfreevegan site suggests 110-115°F for 8-12 hours). I'd like to try other yogurt starters. For 6 ounces or so, I'd like to try a tablespoon of yogurt. I'll look for more plain yogurts, like by Nancy's. It might be good to use a vegan culture, such as is available at Cultures for Health, but it seems expensive - about $10 for 4 uses, each making 1-2 quarts. I could try a probiotic as a starter, such as by Custom Probiotics, which would be much less expensive - a bottle costs $25 for 50g, and only .4g is needed per 2-4 quarts of milk, which means that over 100 batches of 2-4 quarts of yogurt could be made for about 25 cents a batch for the probiotic. Klaire Labs also makes probiotics that are said to be made with no dairy. Probiotics and cultures are often grown on dairy medium, so one has to be careful to get an appropriate product. I'd like to try different unsweetened milks with few ingredients. We should definitely try our homemade almond milk that we make in our blender by blending almonds without skins with water. I recently found how easy it is to make soy milk in the Instant Pot, and should try that sometime. I wonder if I should introduce another ingredient to thicken the yogurt, such as agar, tapioca, pectin, or arrowroot. It may add a little extra processing time, such as increasing the milk's temperature and mixing in the thickener before proceeding, but if I find it gives a pleasing texture that I can't otherwise get, it may be a good option. I'd start with putting the steamer rack into the Instant Pot and a cup of water, putting the bottles with milk atop the steamer rack, and, using the "Steam" button, pressure steam for just a minute. I'd give the Instant Pot 10m or so to come down in pressure, then carefully open it. I'd carefully take the bottles out, remove the steamer rack, and drain the water. Once the milk is under 115°F, or lukewarm, I'd add the starter, put the bottles into the pot without the steamer rack, press the "Yogurt" button, and adjust the time to 14 (or 15 or 16) hours to let it culture that long. When the time is up, the pot can easily be opened. I would do a taste test and, unless I want to culture for longer for more tang, I'd cool and enjoy. 1. Fat matters: higher fat content (higher ratio of soy to water, adding cashews, adding *coconut cream, etc) results in thicker yogurt. *Not necessarily ETL however. 2. Culture matters: I'm thinking about 15-30 billion viable cultures per quart of milk. 3. Time matters: 12 hours seems about right to me. Overnight so my pot is available during the day. The longer it is incubated the more tart and thick it tends to get, but not more than 20-24 hours as then the bacteria run out of food. 4. Cleanliness matters, but sterilization is not necessary. 5. I prefer making it in 8oz jars, but if you have extra liners, you can make it directly in the liner, especially if you intend to strain it for a thicker/Greek style. 6. Making your own yogurt is fun, EASY and can be VERY inexpensive depending on your choices of milks and culture, homemade soy milk and probiotic powder being the cheapest-- unless you use pepper or cherry stems!? smile emoticon Most "failures" can be used in smoothies, so low risk. 7. AND some may wonder: the Instant Pot is SO energy efficient as to use only about .06 kWh for incubating yogurt for 10 hours per one very aware Instant Pot user, Mike Cameron. Less than one cent in his area. I found Upton's seitan on sale today; it's one of my favorite seitans. I was thinking of making a simple pasta dish with seitan and marinara. 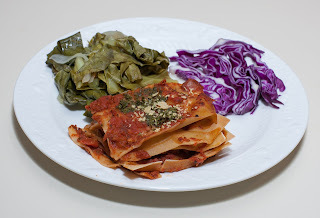 I was out of spaghetti or similar pasta, but did have no-boil whole wheat lasagna sheets. I decided to make a simple lasagna, layering sauce, then bell pepper, then seitan, and then a layer or two of just marinara (I spread a little marinara on top of each noodle), followed by onion and then a top layer, with marinara and two teaspoons of frozen chopped basil on top. I baked at 350°F for 40m. While this was going on, I took advantage of having found local organic collard greens on sale. I took half the bunch, discarded (composted) the bottom inch or two, then cut straight across into inch long segments. I put maybe half of a medium sweet onion cut into 3/8" x 1 1/4" half moons, as well as a clove of garlic cut into 1/4" or so slices into a large Saladmaster stock pan, and then put the greens in, topped with a bit of salt. I covered, brought the pan up to medium heat and, when I heard the vapor lock starting to rattle, reduced the heat to low till the rattling was almost gone, and cooked for 20m (longer would also be okay). I served along with the lasagna. I asked my wife to soak the lima beans in boiling water while I was out doing an errand. The beans had soaked for a little over 2 hours when I rinsed them and then put them, along with the additional 3/4 cup water and bouillon cube, into my Instant Pot pressure cooker and cooked for 28m. After the cooking was done, I waited a few minutes and gently released pressure, then added the bell pepper and corn. I would have been done, but I used frozen vegetables, so turned the pressure cooker on for an additional minute of low pressure cooking. When I was ready to serve, I opened the pot slowly, and added onion, salt, oregano, nutritional yeast, and lemon juice. 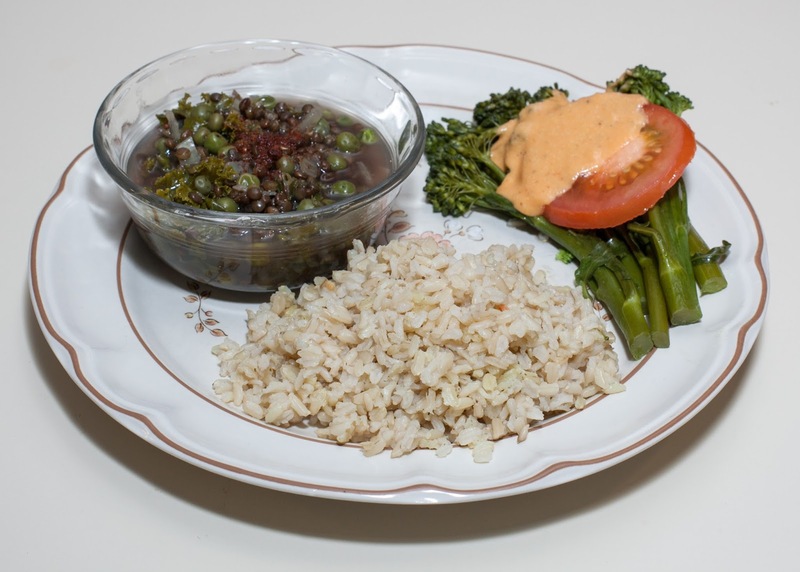 I also made Bhutanese Red rice (ratio of 1 part rice to 1 1/2 parts water, along with a vegan bouillon cube, simmered for 20m, but I usually use a 1 : 1 3/4 ratio) with a little kale. I served the beans with the rice, as well as slices of cucumber atop which I sprinkled salt and garlic powder. We all enjoyed dinner. 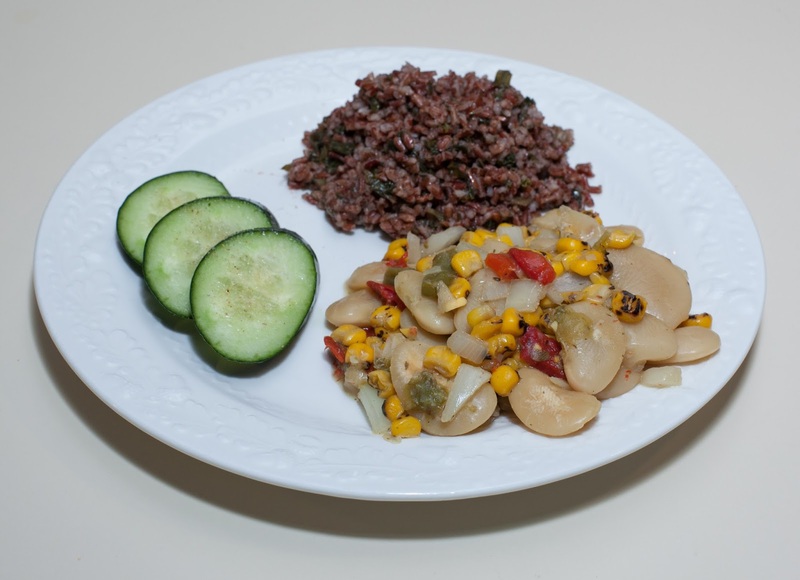 Giant Peruvian lima beans are so creamy and tasty, as well as being so easy to prepare. I really like the combination of nutritional yeast with the Giant Peruvian lima beans. Some ginger may also be good, as well as a bit of jalapeno or other hot pepper. Greens like mustard, chard, or kale would be good, as well. I was shopping a few days ago and found an intriguing looking tempeh, Smiling Hara brand smoked salt and pepper peanut "hempeh". While my wife finds that tofu and most other soy products bother her stomach, she (and most people that I know) can enjoy tempeh without problem. We don't look for soy-free tempeh, and I wasn't even aware that tempeh could be made without soy. I liked the look of this product (made with peanuts, hemp seeds, and rubbed with smoked salt and black pepper), so decided to try it. My daughter wasn't so excited to try this tempeh, so I heated some smoky tempeh for her instead. I also like Kite Hill brand artisanal almond based vegan cheese products. They're expensive, so I don't have them often. Whole Foods Market had prepared lasagne made with the Kite Hill ricotta on sale ($1.99 for a piece), so I purchased some. I heated the lasagne. I took half of the tempeh, halved it, exposing the unrubbed inside, and sauteed in a cast iron pan with no added oil till slightly browned on low-medium heat, flipping a few times. My wife is growing broccoli and harvested some - it's sweet and tasty. 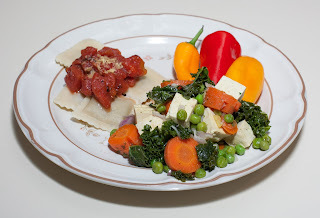 I served the broccoli with slices of a red bell pepper that I had roasted. Dinner was good! My wife loved the tempeh. I thought it was quite good and plan to occasionally purchase it. Happy New Year! 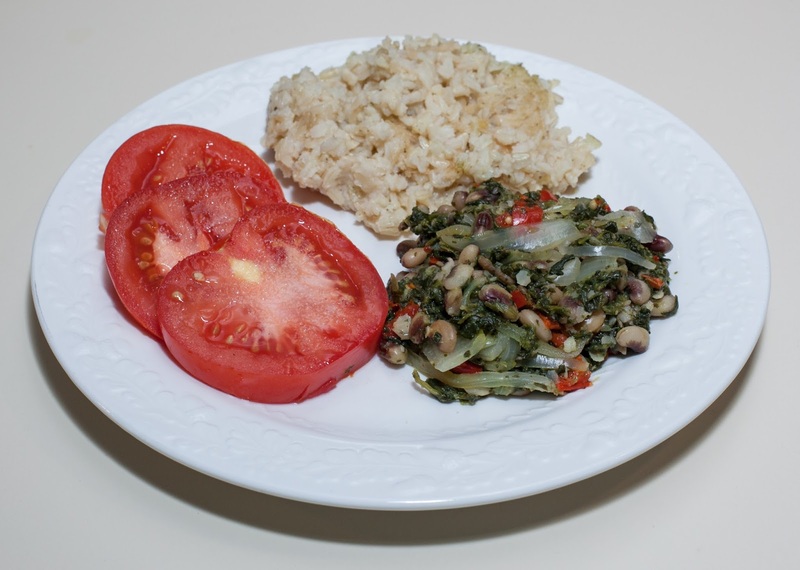 Eating black-eyed peas dishes, such as Hoppin' John like I made in 2013, or black-eyed peas with collards or other greens, is traditional in the Southern U.S. states on New Year's Day. I was thinking of making a black-eyed pea and collard dish, but the store was out of collards, both fresh and frozen (they did have frozen but not organic, which I wanted to get). Instead, I decided to make a black-eyed pea and spinach main course. Here is what I did. I put the black-eyed peas, spinach, and onion into a small Saladmaster stock pot, covered, and heated over medium heat till the vapor release started jiggling from steam built up from the food. I reduced the heat to low to get the jiggling to stop, and cooked for over 20m (even less probably would have been enough and beyond that just kept the food warm). When I was ready to serve, I opened the top, mixed in the Sample rice cooking times in a 1:3 ratio of "rice" (really a grass) to liquid for 25-30m. I put the wild rice, 3/4 cup water, and bouillon cube into my Instant Pot pressure cooker and cooked for 23m. When I was ready to serve, I opened the pot, added salt, turmeric, and oregano, and served my daughter, before adding the sweet pepper and serving my wife and me. I also made brown rice in my Zojirushi rice cooker (1 part rice to 2 parts water, a bit of salt, and a vegan bouillon cube, then "brown rice" program). In the past few years, I've commonly used whole grain rices like Madagascar Pink, Bhutanese Red, and others - they generally cook in about 20-30 minutes, instead of 50 minutes for traditional brown rices. But I have missed the fluffy texture and flavor of "regular" brown rice, and wanted to make some long-grained brown rice today. I sprinkled on some garlic powder over slices of tomato for a salad. My daughter loved the main course, and I liked it. My wife liked it, but wanted more Indian seasoning. She really liked the tomato and wanted me to serve tomato this way again. I should try more greens combinations with black-eyed peas - and just cooking more frequently with black-eyed peas.